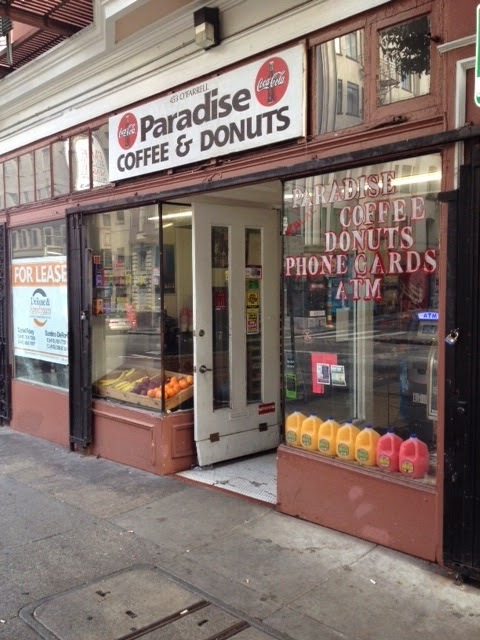 There's nothing so special about this downtown San Francisco shop. There's certainly nothing historic. I just like it's general simplicity, along with the Coca-Cola sponsored signage, the old-style frontage with the indented entrance, the long narrow windows on the door, the thatch of ceramic tiling in front of the door and the rows of transom-like windows at the top. For added value, there's that line of neon-bright "fruit juice" jugs in the window. The liquid inside is sugary poison, but the bottles sure are pretty. It's on a rough stretch of street—near a lot of big hotels, but also in the middle of area favored by prostitutes, druggies and the homeless. So, given that, you can take the place's name as either ironic or hopeful. 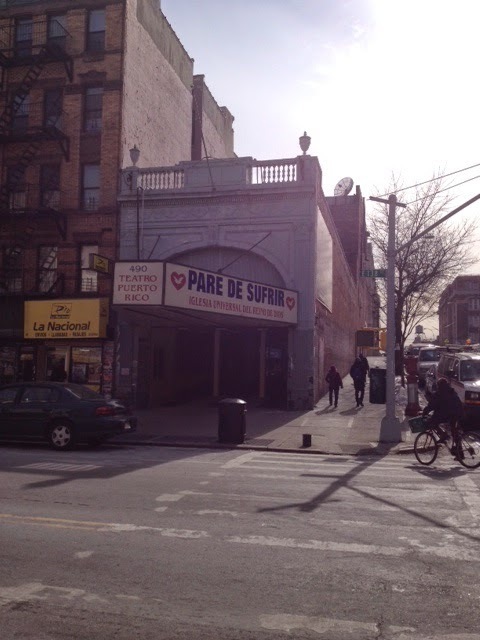 This church, Pare de Sufrir, on E. 138th Street and Brown in the Mott Haven section of The Bronx, hides a great cultural history. The building was one the Forum Theatre. It opened in 1923 with 2,300 seats, offering a little vaudeville along with silent movies. It was an independent theatre, not owned by any big movie house chain. It also had a Kimball organ. After World War II, in 1948, with demographics changing in the area, it became the Spanish-language Teatro Puerto Rico, presenting stage shows. This was the theatre's golden age. It was quite the social mecca for the city's Puerto Rican population, and attracted performers from all over Latin America, and audiences from all over the city. Here's an image of the marquee back then. And here's the theatre. 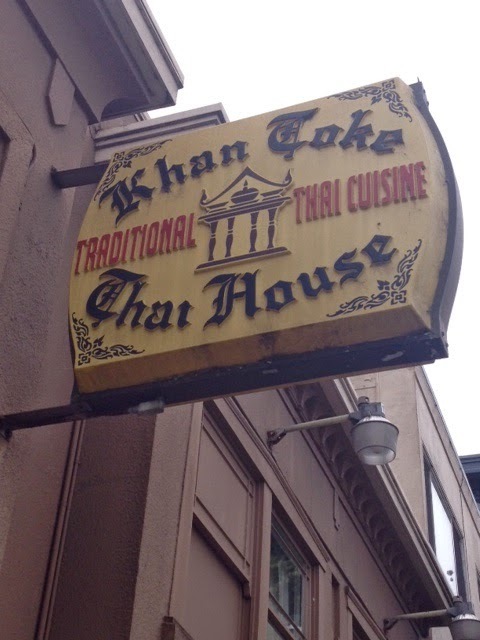 Nice old-school, yellow, inner-lit sign at the Khan Toke Thai House in the Richmond section of San Francisco. 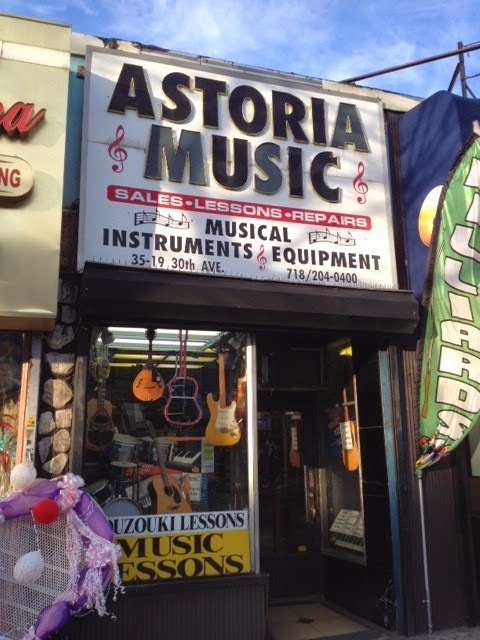 Among the ugly chains stores on 30th Avenue in Astoria is this charming shoebox of an enterprise, Astoria Music, where you can buy musical instruments, get instruments repaired and take music lessons. All in that tiny place. I love the display window, with its hanging guitars and drum sets. 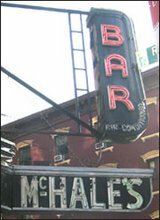 How old is Astoria Music? Would you believe, 1922? And always in the same location. It was founded by the Greek Badgetakis family, all of whom were musicians. In the 1960’s a grandson, John Badget, took over, and in 1982 George Phillips, also a musician and also Greek, bought the business. During the 30’s, 40’s and 50’s, the shop was also recording studio and record shop. If we are to believe the store's website, famous musicians who recorded or bought merchandise here included: "Tony Bennett, Jimmy Rushing, Louis Armstrong, Glenn Miller, Junior Mance, Milt Jackson, Lenny Tristano, Bix Beiderbecke, Dizzy Gillespie, Ben Webster, Buck Clayton, Cannonball Adderly, Woody Herman, Clarence Williams, Eva Taylor, Fats Waller, Billie Holiday, Mercer Ellington, Lena Horne, Ethel Merman, Illinois Jacquet, Charlie Mingus, Russell Jacquet, James P Johnson, Lester Young, Milt Hinton, Count Basie, Jimmy Heath, Nat Adderly, Benny Waters, Ella Fitzgerald, Phil Schaap, Roy Eldridge, Clark Terry, Percy Heath, John Coltrane." Hard to believe. But I hope it's true. I was stunned when I walked by this old mill building in Port Morris, a former industrial section of the southern Bronx which is little discussed in the daily goings-on of the City. It's a simple building, but by the brickwork and the shape and number of the windows, it looked immediately to my eyes like a relic of the Industrial Revolution, the kind of mill that immigrants slaved in during the latter 19th century; something out of Dickens. And it seems to be in perfect condition. 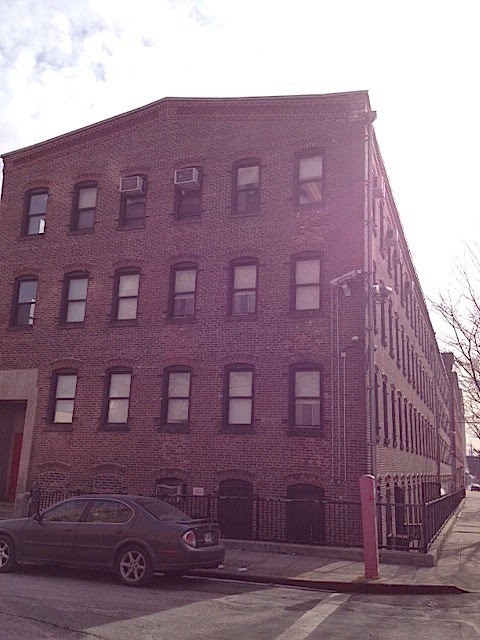 Taking a close look, I saw the building was the work of Philip Knitting Mills. Our friends at Forgotten New York tell us: "Morris Philip (who has an appropriate first name in this part of the Bronx) was the firm’s founder. Besides having patents for some specialized knitting machines, he’s most famed for inventing the Philip Cup, the splash proof coffee cup lid. The Philip Cup factory was located at 26 Bruckner Boulevard." 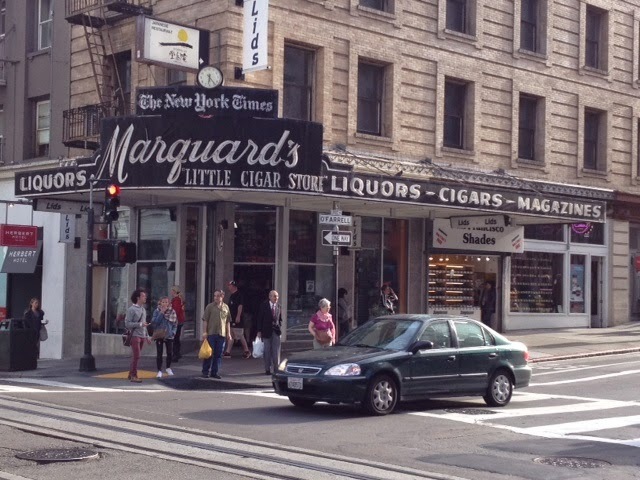 "A Good Sign" hardly seems to do justice to the former Marquard's on O'Farrell and Powell Streets in downtown San Francisco. How about "A Really Good Sign," or "A Great Freaking Sign!"? Marquard's Little Cigar Store certainly didn't have a little sign. The sprawling signage—more of a marquee/awning/canopy than a sign, really—embraces the entire corner. Sadly, the sign is all that remains of Marquard's; there a rinky-dink hat shop in that corner space now. The building was erected in 1907. The cigar shop and newsstand (note the neon New York Times sign) went out of business in 2005, but the City happily declared the sign a landmark worth preserving. 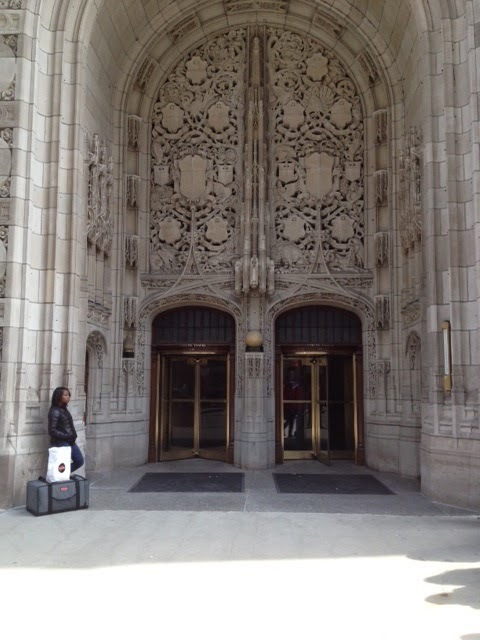 Everyone who works at a newspaper should begin the day by walking into a building like the Chicago Tribune's. Perhaps it would remind them of the potential nobility of their profession and how journalism can be, and should be, a pillar of Democracy. The Happy Hour movie theatre was located at 225 Columbia Street. During the 50s & 60s every kid in the neighborhood was there every weekend. They had a section in front for all unescorted kids so that the adults could watch the movie in peace. For your 40 cents admission you got a double feature, shorts, cartoons and coming attractions. At 6:00 they would let the parents go in for free because they were just picking up their kids. They always showed a current film with an older one. I remember in the mid 1960s they showed "Beach Blanket Bingo" along with "Against All Flags" with Errol Flynn. Izzy's candy store was next door to the theatre so everyone would pool theie extra money and buy a bag of penny candy and bring it into the theater. Just before it closed down the theatre was not in the best shape. I remember that you had to walk along the walls in the bathrooms because the ceilings leaked in the center of the room. It was still the best way to spend your weeking. I miss it. The Happy Hour was built in 1915. It was a small theatre. It closed in 1966 and was demolished in 1972. Wish I had a photo of the place. Anyone out there have one? Old New York Pizzeria's often have good signage, but typically not of the neon sort. Rizzo's Fine Pizza in Astoria is a happy exception. That's got to be one of the peachier neon signs I've ever seen on a slice joint. And how many pizzeria's chose to describe their cuisine as "fine"? 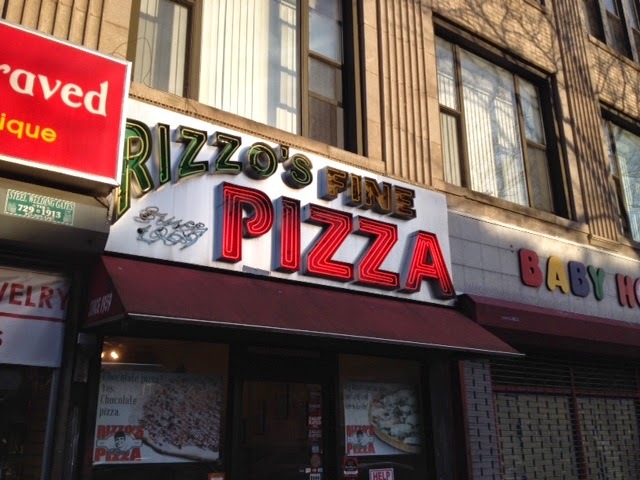 Rizzo's was founded in 1959 by the brothers Joseph and Salvatore Rizzo, along with their brother-in-law Hugo Lupi. Squares are the order of the day here. Rizzo's specializes in thin-crust Sicilian, an unusual pizza genre. 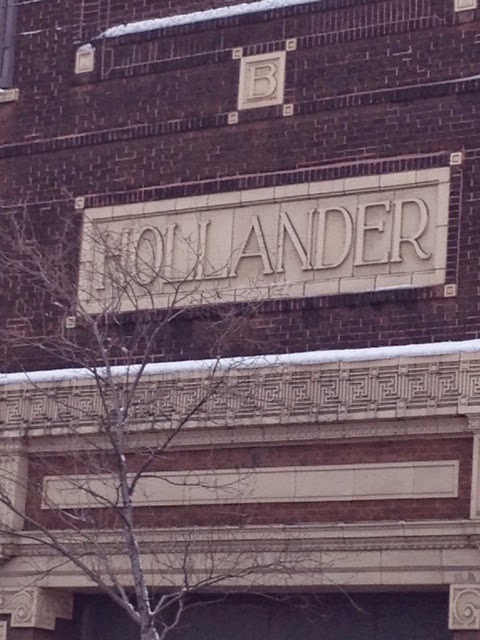 Shiver and cower before the hulking immensity of Hollander Storage in the Logan Square section of Chicago! Ahem, excuse me: Hollander International Storage and Moving Company, Inc. The enterprise's full name, don't you know. This business was founded in 1888. 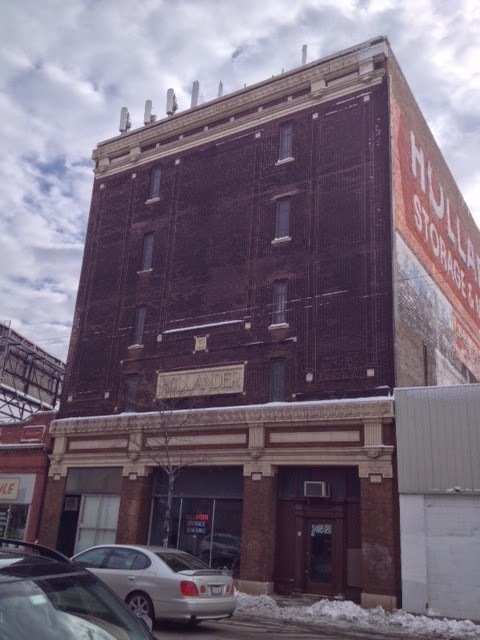 And, as far as I can tell, this impressive, five-story, brown-brick building was erected around that time period. The outfit is still in family hands. The website tells us, with due confidence, "Whether you require residential moving, business relocation, long-term storage, or something in between, it's a commitment four generations of the Hollander family has nurtured." Hey, they've got my attention. 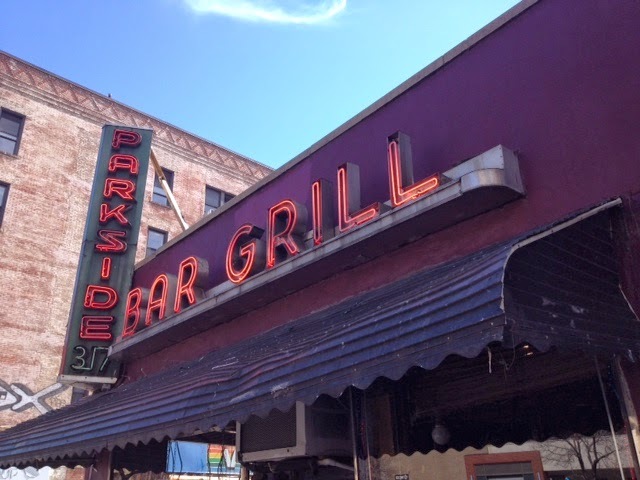 The Parkside Lounge has been lending beauty, grit and integrity to the corner of E. Houston and Attorney Streets for decades. How they stay in business in this climate, I do not know. The owners must one the one-story building. 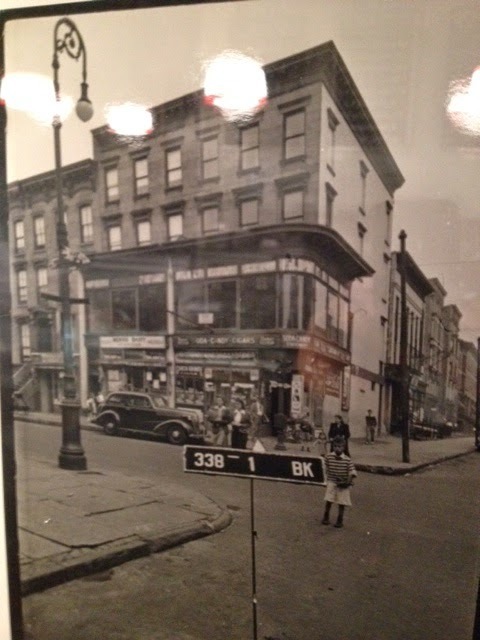 I am quite familiar with the northeast corner of Henry and Union Streets in Carroll Gardens. I've eaten many a slice of pizza there over the years, first at Nino's, a neighborhood institution that closed in 2007, and then at its replacement, the not-dissimilar Francesco's. A recent rent shake-up caused Francesco's to move and reopen in what was once half of its former space, on Henry Street; the other half, on the corner, is empty for the time being. Going into the new half-Francesco's recently, I spotted on the wall the above photograph, which told me something about the corner's pre-Nino's history. That the area was once occupied by a candy store and a dairy shop of some sort is less interesting to me than the look of the building in this 1940s photo. Today, the two, two-story storefronts attached to those two Henry Street brownstones are covered in nondescript red brick. They are not attractive. In this photo, however, the two storefronts are just gorgeous. Look at that curbing, long cornice, that immense stretch of plate glass. If I'm not mistaken, there's some stained-glass panes on top of each larger window. The Logan Square neighborhood of Chicago, down on its luck for some years but now in the midst of a resurgence, has been robust enough to hold on to its grand old movie house, appropriately named the Logan. It's a bold presence with a large vertical sign climbing up the facade and an old-fashioned marquee and box office, and a lovely stained glass arch outside. Inside, there's a rather spectacular, Art Nouveau, fully stocked bar. I'd go to the theatre just to drink there. Louis Zuflacht. What a name. Hard to forget. Especially when it's in large metal letters (formerly lit by neon), in an ostentatious font, on the side of a building. That's the name that has graced the building at the corner of Suffolk and Stanton Streets for many decades now. 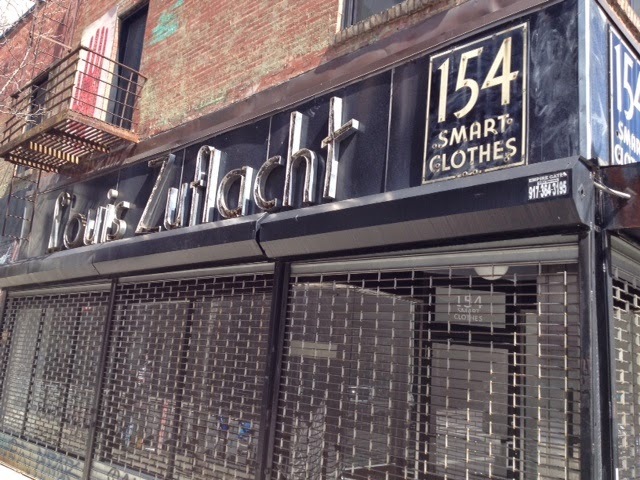 A clothier, Zuflacht hasn't done business out of this storefront in a generation or two. But subsequent occupants of the address—either out of deference to the lovely signage, or out of laziness—have left Louis' name up there, ensuring that the former proprietor has not entirely passed from public memory. I've passed by the sign dozens of times and never bothered to look up his story, though I've always been intrigued. It seems the right time to correct that error since the shop is unoccupied at present (after being everything from an art gallery to a video gamer hangout), so, it could be argued, 154 Stanton Street belongs to Louis Zuflacht more now than in has in many years. Cute little store on George Street in New Brunswick, NJ. 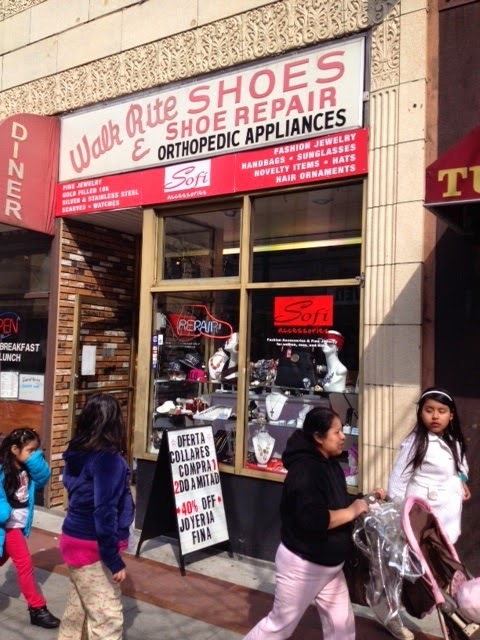 There's another Walk Rite in Newark. A mini-chain? The diner next to this shop isn't a bad joint, either. When voices like mine bemoan an old business going down, we don't always mourn the event for the same reasons. Some businesses are missed because they are classic purveyors of their type (the Stage Deli, for instance). Some because they are part of the fabric of a particularly neighborhood (the Hat restaurant, or Milady's). Some because they did one special thing better than everyone else (Joe's Superette, with their prosciutto balls). Some because they perform a bygone task that nobody else does anymore (typewriter report, for one). And some just because they are remarkably old (Manganaro Groceria Italiano). 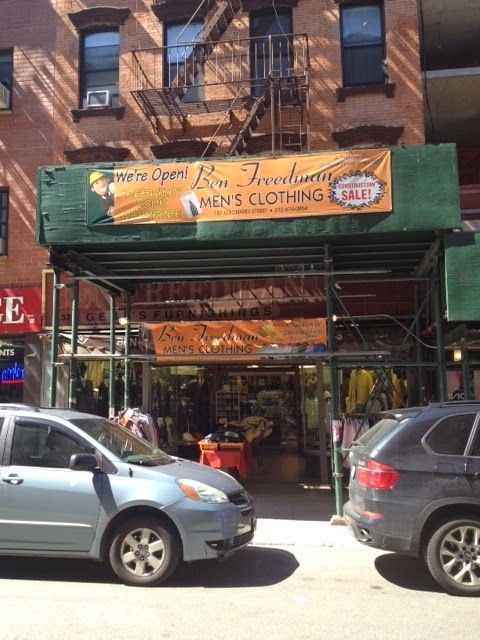 Take Ben Freedman Gent's Furnish, one of the last old-school garment hawkers left on the Lower East Side. It's been there on Orchard since 1927, which makes it pretty old. But it's not a classic. The name Ben Freedman is not normally on the lips of everyday New Yorkers. It is not a famous store, and it does not carry the best clothes in town. 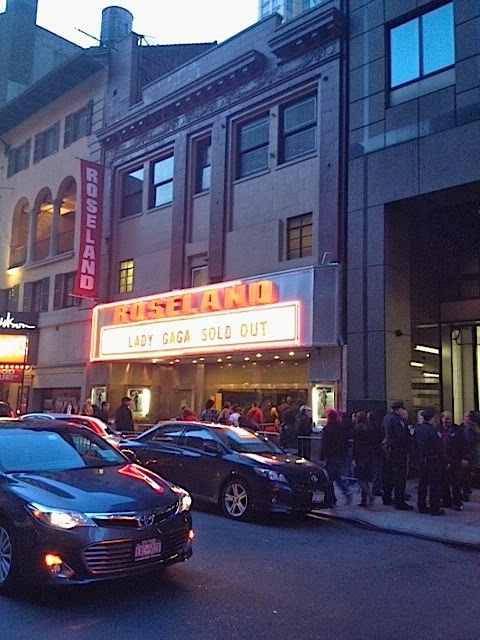 Roseland Ballrom, the iconic dancing and concert hall set in what was once the cultural center of the Universe (i.e. Times Square), is set to close April 7. Roseland did not play a large part in my New York experience, not directly anyway. I have been, in fact, to Roseland a grand total of once. The occasion was an opening night party for a Broadway show opening. I danced. I can say I actually danced at Roseland. Still, like so many New York landmarks that we take for granted, it did play a kind of contextual role. 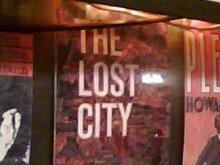 I often walked by it and thought to myself, yes, I live in a city that contains Roseland, a legendary dance hall and music venue, and has contained it for decades. Thoughts like that, however fleeting, are often what keep you going in New York. As E.B. White repeated often in his famous essay "This Is New York," I "did not attend." But I could have. Blooms on Fifth—Fifth Avenue in Park Slope, Brooklyn, that is—holds down a nice little storefront. Not an unique one; it's obviously a twin to the building to the right. But, unlike it's neighbor, it's managed to hold on to more of its original two-level storefront. The store's website doesn't tell you much about the site's history. (What is it with florist websites, by the way? I have noticed over the years that they are uniformly anonymous and nondescript and offer nothing in the way of business history, even when the business is very old.) 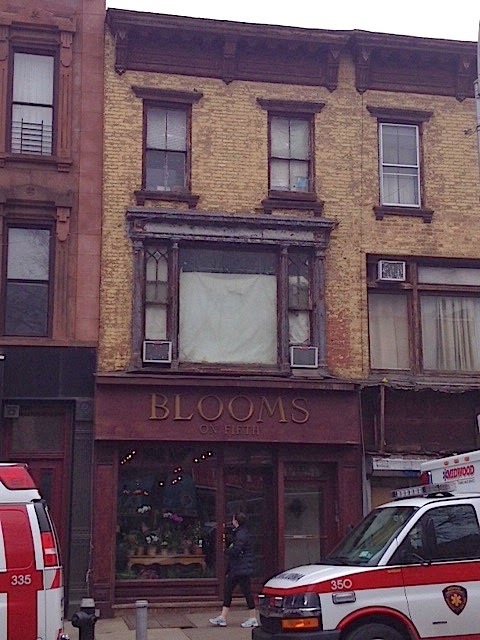 However, there is a line saying "Blooms on Fifth, Ltd. has been proudly serving the Brooklyn area for over 83 years." At this location? With that very-modern-sounding name? It doesn't say. But there's a chance that Blooms has inhabited the three-story brick structure since the 1930s. There was indeed a florist here in 1965—a gentleman named James Daniel—according to a New York Times account. Levy's pizza was something special, ironic in that a purveyor of a very ordinary pie (Roma) now occupies that location. The Levy pizza was unique in its composition of very thin crust, slightly tangy sauce and relatively light quantity of mozarella. I'd classify it as highly addictive. I lived in the neighborhood but had a friend "hooked on the pizza" who would often travel from midtown to partake of several slices. From my recollection, they served that same recipe from as far back as the '60s into the early '80s at which point they switched over to a more conventional product. Apparently, the Levy slice is something that must remain but a fond memory. 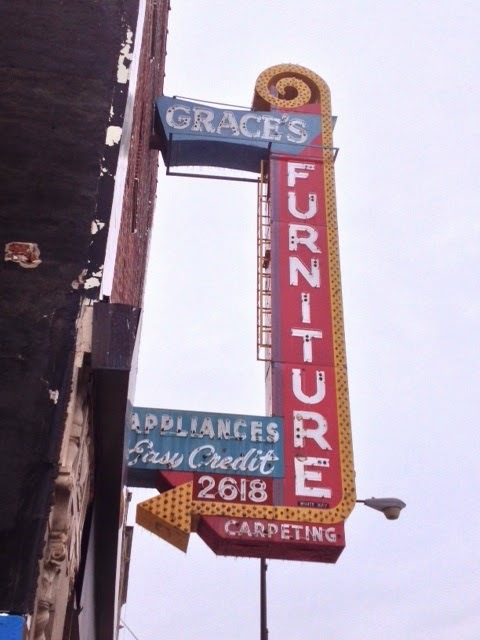 This fabulous sign—much too fabulous for a furniture store—is just off Logan Square in Chicago, on Milwaukee Avenue. Carpeting, Appliances, Easy Credit. Grace really spelled it out for you. The sign's not as old as it looks. Grace's Furniture was founded in 1974 by Julio and Digna Martinez. It was named after their daughter. It went out of business in 2010. 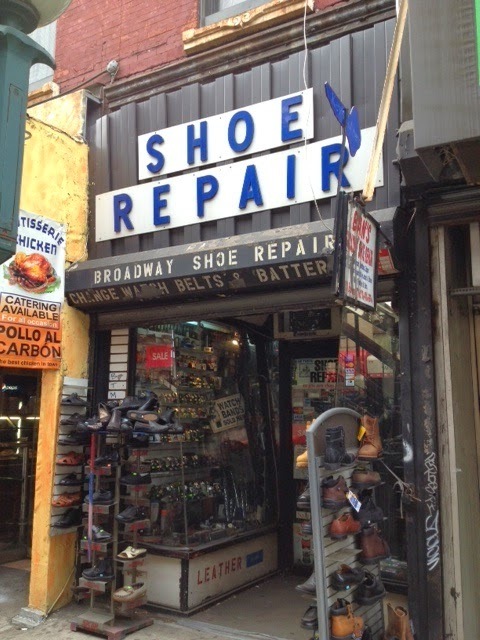 This tiny place is either called Broadway Shoe Repair or Ban's Shoe Repair. (The signs vary.) 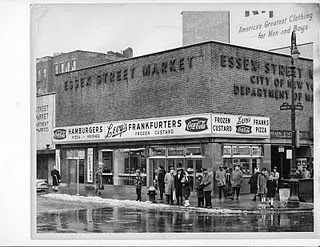 It is at 272 Broadway, under the shadow of the Marcy Avenue elevated JMZ subway track. It's one of the last really old looking shops on that strip, which has become crowded with crummy chain stores. Note that, despite the narrow frontage, the shop managed to have an indented entrance and glass display cases on either side. Based on Yelp reviews I've read, the little shop boasts great service and low prices. Seems to be a vestige of an old-fashioned merchant work ethic.